Since its publication in 2003, the availability of Harwood’s Collected Poems 1943 – 1995 has allowed students and teachers to gain a deep understanding of her work, through the long view of its development over her life. Born in Brisbane in 1929, but living most of her adult life in Tasmania until her death in 1995, Harwood inhabited a number of identities that reflect the protean quality of her poetic personae. In the above quote, poet and critic John Kinsella describes the contradictions and surprises to be found in Harwood’s work, particularly its sometimes ‘savage’ manner and ‘horrific’ view of human nature. A famous example of these qualities is found in Harwood’s short poem, Suburban Sonnet. In fact, the poem’s brevity is an important contribution to its savage effect: Harwood presents no resolution, happy or otherwise, to her protagonist, the mother; rather, the poem leaves her occupied with yet another banal task and an unfulfilled sense of irony. It’s not that this mother is per se unhappy, but that she is neither happy nor unhappy. The poem vividly captures in-between experiences – frustration, tiredness, haste, distraction – that are savagely real. Perhaps it was Harwood’s unflinching vision that impressed the adolescent Kinsella: ‘Her poetry is a power to be reckoned with, and a teenage boy’s assumptions about distant aunties and women in general took a necessary knock’ (Kinsella p. 12-13). Suburban Sonnet and its equally famous counterpart, In the Park, develop the significant theme of gender in Harwood’s oeuvre, which is carried into later poems such as Mother Who Gave Me Life. The value of Collected Poems 1943 – 1995, however, is that it situates this within the broader scope of theme, voice and style in Harwood’s poetry. The collection is edited by two leading Harwood scholars and friends of the late poet, Alison Hoddinott and Gregory Kratzmann. Hoddinott has written numerous scholarly articles as well as essays and reflections on Harwood’s poetry and person, including the book study, Gwen Harwood: The Real and the Imagined World. She has explained the process of ‘Editing Gwen Harwood’ in a moving personal essay and, more recently, discussed her friendship with Harwood and ways of understanding certain of her poems, in an interview for mETAphor. Kratzmann has edited Harwood’s letters in A Steady Storm of Correspondence: Selected Letters of Gwen Harwood 1943–1995 , as well as two editions of her selected poems:Selected Poems: A New Edition; and, with poet and critic Chris Wallace-Crabbe, Mappings of the Plane: New Selected Poems. Kratzmann, a reviewer and academic, has also written several reflections on Harwood’s oeuvre including insights into her work’s engagement with music, pseudonyms and occasional verse (poems written to commemorate events). The tonal range and variety of her poetry leads to an interesting paradox. On the one hand she writes poetry which is strongly allusive, deeply grounded in her interests in European poetry, music, and philosophy, so that she is very much a ‘poet’s poet’, whose work has been the subject of extensive critical debate. On the other hand, much of her poetry appeals to a wider audience (p. xix). from thought upon night’s tide like froth. The ‘tonal range’ contained within Collected Poems also rewards more complex, independent textual analysis. It invites teachers and students to explore how a poem can mean and do many things at once, not only structurally but also representationally. This is what Hoddinott and Kratzmann mean by a ‘poet’s poet’: Harwood is a poet highly respected by other poets for the complexity of her language, facility with form, and philosophical investigation. One way in which the editors of the text have recognised the multiplicity of Harwood’s poetic voice is by identifying her pseudonymous works by their invented authors. Harwood’s poetic pseudonyms and their poetic output have been the subject of numerous critical studies, and continue to provide an amusing and provocative source of thinking about her poetry more generally (for various angles on this element of Harwood’s Collected Poems see the critical works of Kratzmann, Cassandra Atherton, Richard King and Stephanie Trigg). A classroom focus could be made, for instance, on the poems of Harwood’s alter-ego, Timothy (TF) Kline, an anti-war protest poet: what does Harwood, as Kline, say about Vietnam and the modern Australian identity? As well as multiple personae, modes of self-awareness appear in Harwood’s writing and refuse any easy reduction of its intentions or affects. For instance, discussion of her pseudonyms can be extended into critiques of her dramatic characters and voices. John Beston, Douglas Dennis, A.D. Hope, Vincent O’Sullivan and I have each examined how Harwood’s characters relate satirically to her own experience with Australian culture and gender. In the Professor Kröte and Professor Eisenbart sequences, characters and narratives run across poems, seeming to take on a life of their own. A rewarding study might follow the travails of Kröte, a romantic European immigrant, or the tension between science and art felt by Eisenbart. And, as ‘Del Chessell has pointed out, ‘Harwood, fed up with the critics assuming every speaker in every poem was identical with herself, spoke of the operatic Iin her poems, implying the assumption of a role’ (p. 50). I rose, blessed by the sun. out with my father’s gun. would punish beak and claw. Read it very carefully and link it to the other poems. Look at the form of each poem and see how varied they are. Become aware of her as a human being who is writing about her own life and writing as she develops (“Memories, moments and musings about Harwood.” p. 28). on earth, cockcrow and changing light. Chris Wallace-Crabbe remarks upon this poem that, ‘the landscape is charged with the present and past . . . of remembering as well as perceiving’ (The Wheeler Centre, web video). This braided perspective is also found in ‘Barn Owl’, where the speaker’s self-realisation marks not only her maturity but her humanity. As well as ‘Barn Owl’ andEstuary, this focus would include poems such as At the Water’s Edge, Littoral andThreshold among others. Students of Collected Poems can appreciate that Harwood goes beyond simply representing place or personal experience; she undertakes a more aesthetic crafting of the immediate world as a trigger, symbol and illumination of what is absent, immaterial or unknown to us. While there is a strong Christian subtext across Harwood’s Collected Poems – knowledge of which is not mandatory to an investigation of her work, but certainly available to readers who wish to consider what it adds to Harwood’s philosophical query – it should be reconciled with her materialist appreciation of mortality and the corporeal, ‘the real world of human relationships . . . music, friendship, the natural world’ (Hoddinott “Memories, moments and musings about Harwood.” p. 25). Collected Poems reveals to students the delicious and unfolding experience of finding the recurring poetic motifs, themes, symbols, settings and figures in a life’s work. As Wallace-Crabbe puts it, Harwood ‘could write her meanings, she could write her life into this low-angled sunlight, these cold, clear, bright, beautiful shorelines’ (The Wheeler Centre, web video). Allen & Unwin. Bonny Cassidy—Gwen Harwood’s ‘Barn Owl’: family as a stage for big ideas. 29 June 2009. Web video. Chessell, ‘D. “The Heart’s True Life: Teaching Gwen Harwood.” Idiom 46.1 (2010): 50-53. Hoddinott, A., Kratzmann, G. eds. 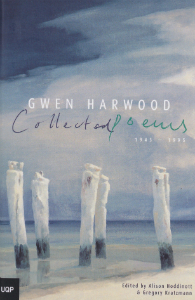 Gwen Harwood: Collected Poems 1943 – 1995. UQP, 2003. Hoddinott, A. “Editing Gwen Harwood.” Island 111 (Summer 2007): 29-45. —. “Memories, moments and musings about Harwood.” Metaphor 1 (2013): 22-28. Kinsella, J. “Textual feminism.” Island 129 (Winter 2012): 11-13. The Wheeler Centre. Texts in the City: Collected Poems of Gwen Harwood. 18 May 2012. Web video. Atherton, C. Flashing Eyes and Floating Hair: A Reading of Gwen Harwood’s Pseudonymous Poetry. Australian Scholarly Publishing, 2006. Beston, J. “Artists and Academics in the Poetry of Gwen Harwood.” Quadrant 18.3 (1975): 21-27.
the Vices of the Intellect.” Australian Literary Studies 6.3 (1973): 77-82. —. “Gwen Harwood—Poet as Doppelganger.” Quadrant March 1969: 15-19. Harwood, G. “The Evanescent Things.” Interview with Jenny Digby. A Woman’s Voice. Hoddinott, A. Gwen Harwood: The Real and the Imagined World. Angus & Robertson, 1991. Hope, A.D. “Gwen Harwood and The Professors.” Australian Literary Studies 5.3 (1975): 227-232. King, R. “A symphony complete: the range of voices employed in Harwood’s poetry”. Meanjin63.1 (2004): 185-190. Kratzmann, G. ed. A Steady Storm of Correspondence: Selected Letters of Gwen Harwood1943–1995. UQP, 2001. —. ed. Selected Poems: A New Edition. Penguin, 2001. Kratzmann, G., Wallace-Crabbe, C. eds. Mappings of the Plane: New Selected Poems. Fyfield Books, 2009. O’Sullivan, V. “Voices From the Mirror.” Gwen Harwood. Ed. Robert Sellick. Flinders UP, 1987. Strauss, J. Boundary Conditions: The Poetry of Gwen Harwood. UQP, 1992. Print. Trigg, S. Gwen Harwood. OUP, 1994. Dr BONNY CASSIDY is a poet, essayist and critic. Her debut collection, Certain Fathoms (Puncher & Wattmann, 2012), was shortlisted for the WA Premier’s Book Awards 2013, and her poetry has appeared in Young Poets: An Australian Anthology (John Leonard Press, 2011), the Australian, the Age, Best Australian Poems 2010–2013 (Black Inc) and numerous literary journals in Australia and internationally. As well as teaching creative writing and literary studies, Bonny has worked on poetry education programs including The Red Room Company’s Papercuts program, the National Gallery of Victoria’s Ekphrasis Poetry Program 2011–2013, a pilot poetry workshop for the Dax Centre, and poetry courses at the Melbourne Free University.